Snippets of Jack: "It goes with your black heart." "It goes with your black heart." Bo'Sun didn't even let her dive in, he whacked the deck and in to the blue ocean she went. Jack tried to weasel out of being marooned on a familiar island with Elizabeth, But he failed of course. Well I guess he and Will need to work on their negotiating skills, maybe they can take some group classes together. But anyways, Jack and Elizabeth discover some rum and party into the night....well Jack does, While he is getting drunk Lizzie is hatching a plan to bring the rescuers to the party. 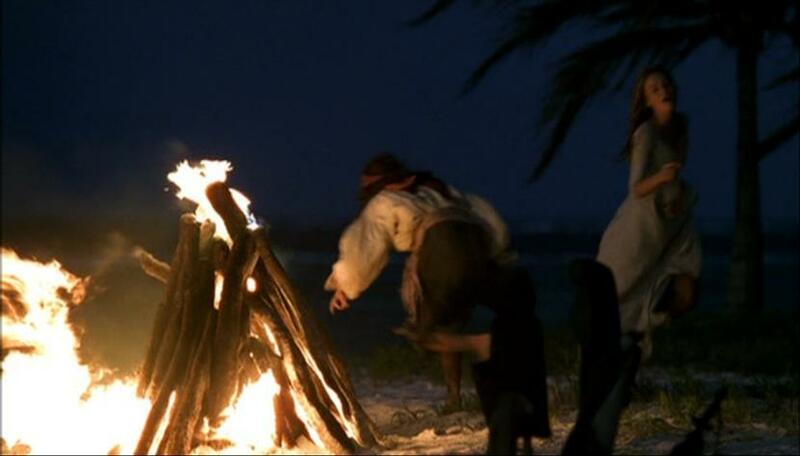 After Jack fell asleep she set all the rum on fire. Her plan worked, but Jack wasn't very happy with her afterwords. Darling Norrington happens along and save Jack and Elizabeth who then tries and fails to convince her father to return to the pirates and save her true love; Will. Elizabeth: "But we've got to save Will!" Governor Swann : "No! You're safe now. 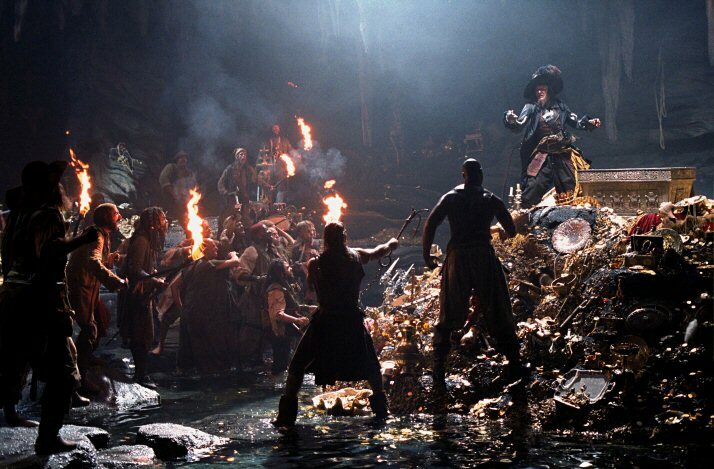 We will return to Port Royal immediately, not go gallivanting after pirates!" Elizabeth : "Then we condemn him to death!" Governor Swann : "The boy's fate is regrettable... but then, so was his decision to engage in piracy." Well they just gave her the stink eye and the "Umm heck no" face, Ouch. And then they locked her in a cabin, which unfortunately had a window, and lots of sheets. But that doesn't come into play for a little bit. While all this is going on, the pirates on board the Pearl are sailing back to island full of treasure and the chest of cursed gold medallions. Also happening around this time, is the conversation that we previously discussed between Jack and Norrington in which Norrington is pigheaded and won't take Jack's advice. So Jack switched plans and heads on over to the pirates and warns them of their inanimate defeat if they break the curse right away. These guys are smart and they listen to Jack and decide to go kill all the Navy men with their ghostly powers. But where is Elizabeth you might ask? Well she is sneaking out like a little rebel and rowing her little boat over to the treasure and pirate filled Isle de la Muerta to rescue her beloved Will. Well she made it right on time, after reuniting with Will she joined in the most recent fight between the pirates and give them a piece of her mind "You think you know pain? Try wearing a corset!" Well that corset have gotten her in quite a few sticky situations, but sometimes it does come in handy. 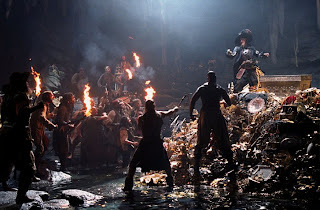 While Liz and Will are fighting boring crew members Jack and Barbossa are battling it out in a potentially never ending fight between to men who can't die. Yippee! We all know Jack wins in the end of course, but what about those Navy men and the Pirates? Well the Navy men were getting their butts kicked for quite awhile until Will saved the day by breaking the curse and ending both fights. Go Will! But thats not the end of our tail....How will Elizabeth convince her Father to let her follow her true calling? I bet that corset he bought her might come back to haunt him. Fun post! You guys are doing such a fun job with this blog!